For the last 30 years, Margery Pearl Gurnetts’ professional carreer was spent working in hot glass. Over the past few years, exciting new work has emerged from her studio, that would be considered primarily mixed media, with a focus of incorporating glass into solid diorama-like wall pieces. The work is both abstract and narrative. She has been embedding dream-like images into the layers of glass, which adds an anecdotal component to her work, and helps to define the “story“ for each piece. 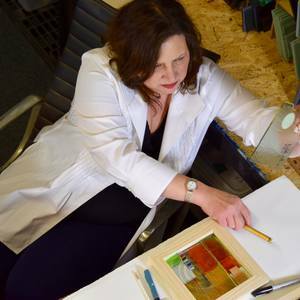 These 3-D, mixed media pieces consist of colored and clear sheet glass, paint, paper, photographs, kiln cast glass, resin, glue, encaustic, fused glass, silkscreening onto glass, fused fired decals, sandblasted glass and found objects. Her work is influenced by glass artists Bertil Vallien, and Dana Zamecnikova in the way the artists suspend and embed inclusions and images, which appear to float in space. Margery Pearl Gurnett graduated from Carnegie Mellon University where she completed her Bachelors Degree in Fine Arts in 1977. She moved to Rochester for her Masters Degree in glass at the School For American Craftsmen at the Rochester Institute of Technology which she received in 1986.